By Veronika Kero for Fordham News on July 3, 2017. 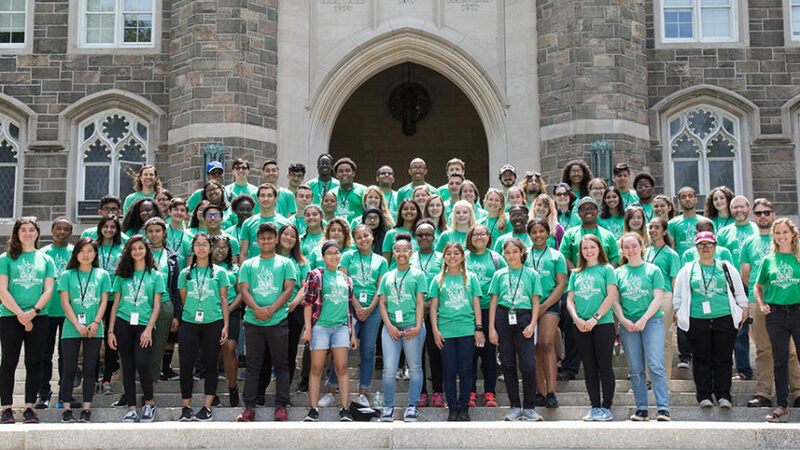 On June 29, some 70 members of the 2017 Project TRUE team joined for a photo outside of Keating Hall on Fordham’s Rose Hill campus to mark the beginning of a seven-week program. Funded by the National Science Foundation, Fordham University, and the Wildlife Conservation Society, the program consists of both a social science research study and a youth development program. Members are chosen from New York city area high schools, and tutors are supplied by the University. “We are taking the kids out of the classroom and putting them into nature. They are able to see the complexity between nature and human behavior through Project True and we hope that that will get them thinking about how everything is intertwined and how the decisions they make are connected to so many other things,” said program director Jason Aloisio. This year, its participants include 50 high school students (coming from all boroughs of New York City as well as Long Island, Westchester, and New Jersey), 13 Fordham undergraduate students, and three graduate students from Fordham’s biology department. They will conduct research all around New York City, working heavily with teams that are stationed at the Prospect Park Zoo, Central Park Zoo, and the Bronx Zoo. Lexie Neffinger, an undergraduate senior and environmental science major at Fordham College at Rose Hill, saw many benefits in joining Project TRUE for the younger students, as well as herself. Michael Romero, a junior at Cardinal Spellman High School in the Bronx, was excited for his future endeavors with Project TRUE. At the end of their seven weeks, the students will present their research at the annual Bronx Science Consortium Poster Symposium, hosted at the Bronx Zoo on Sept. 27. Next → Next post: Google Spent 2 Years Studying 180 Teams. The Most Successful Ones Shared These 5 Traits. Insights from Google’s new study could forever change how teams are assembled.